With Angular 2 now out, we have a look at how to test this new breed of Angular applications. Follow along with a detailed example! Click here to see an updated version of this tutorial that's been upgraded for Angular 2.0 RC1. This article is the second in a series about learning Angular 2. 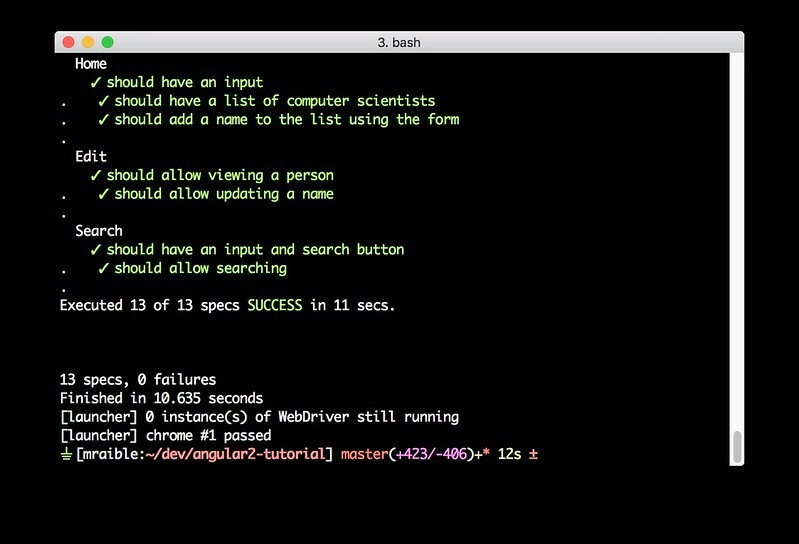 It describes how to test a simple Angular 2 application. In a previous article, Getting Started with Angular 2, I showed how to develop a simple search and edit feature. In this tutorial, I did my best to keep the tests similar to last year's Testing AngularJS Applications so you can compare the code between AngularJS and Angular 2. You'll learn to use Jasmine for unit testing controllers and Protractor for integration testing. Angular's documentation has a good guide to unit testing if you'd like more information on testing and why it's important. Clone the angular2-tutorial repository using git and install its dependencies. If you haven't completed the Getting Started with Angular 2 tutorial, you should peruse it so you understand how this application works. You can also simply start the app with npm start and view it in your browser at http://localhost:5555/. Create src/shared/services/search.service.spec.ts and setup the test's infrastructure using MockBackend and BaseRequestOptions. If you run npm test, you'll get a failed build from a number of unused imports. You can fix those by adding the first test of getAll(). This test shows how MockBackend can be used to mock results and set the response. When you are testing code that returns either a Promise or an RxJS Observable, you can use the fakeAsync helper to test that code as if it were synchronous. Promises are be fulfilled and Observables are notified immediately after you call tick(). Running npm test should result in "10 tests completed". Add a couple more tests for filtering by search term and fetching by id. Create src/shared/services/mocks/search.service.ts and populate it with spies for each method, as well as methods to set the response and subscribe to results. In this same directory, create routes.ts to mock Angular's Router, RouteParams andRouterProvider. Add a spec for the EditComponent as well, verifying fetching a single record works. Notice how you can access the component directly withfixture.debugElement.componentInstance, or its rendered version withfixture.debugElement.nativeElement. Create a file atsrc/search/components/edit.component.spec.ts and populate it with the code below. You should see "✔ 20 tests completed" in the shell window that's running npm run karma.start. If you don't, try cancelling the command and restarting. This happens because we added a Search link to the navbar and didn't update the test (inapp.component.e2e.ts) that looks for the last child. Create a new search.component.e2e.ts spec in the same directory as yourSearchComponent. Add tests to verify elements are rendered correctly and search works. At the time of this writing, Protractor's by.model and by.repeater don't work with Angular 2. For this reason, I used by.css to verify the HTML renders as expected. Create a edit.component.e2e.ts spec to verify the EditComponent renders a person's information and that you can update their information. Run npm run e2e to verify all your end-to-end tests pass. You should see a success message similar to the one below in your terminal window. I originally wrote this tutorial in Asciidoctor because it has a slick feature where you can include the source code from files rather than copying and pasting. Unfortunately, GitHub doesn't support includes. You can use DocGist to view this tutorial, but includes don't work there either. If you'd like to see the Asciidoctor-generated version of this tutorial, you can install the gem, checkout the project from GitHub, and then run asciidoctor TESTING.adoc to produce a TESTING.html file. 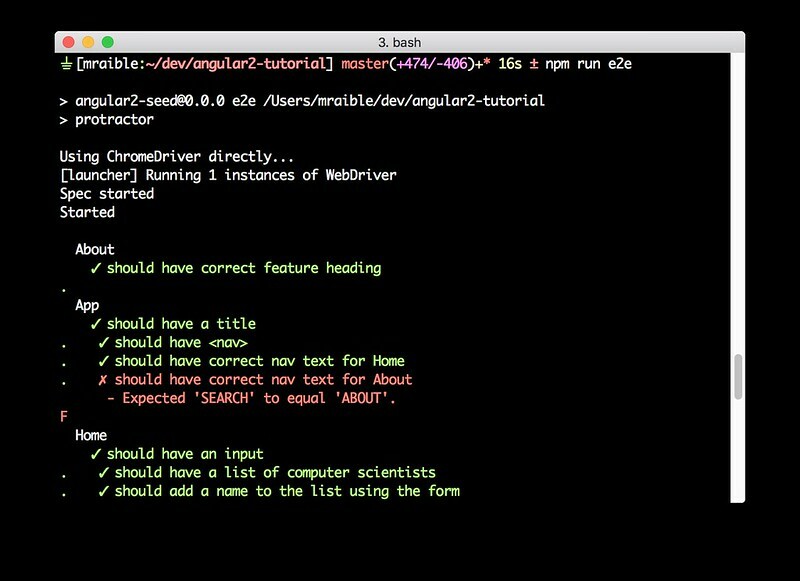 I hope you've enjoyed this quick-and-easy tutorial on testing Angular 2 applications. 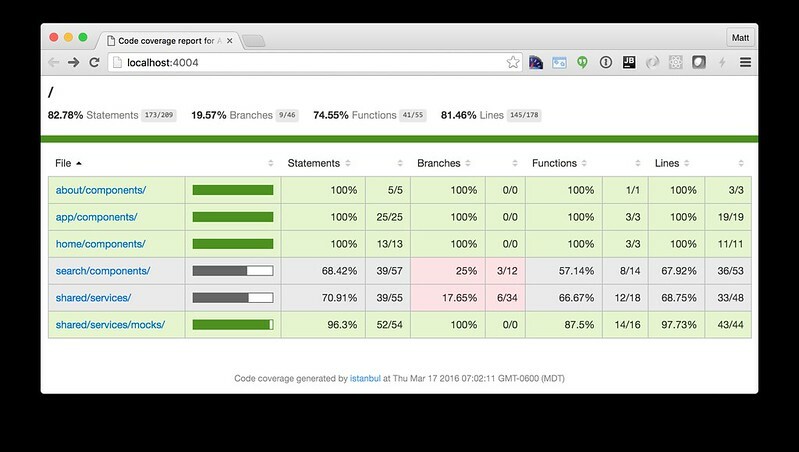 You can see the test coverage of your project by running npm run serve.coverage. You'll notice that the new components and service could use some additional coverage. I'll leave that as a task for the reader.